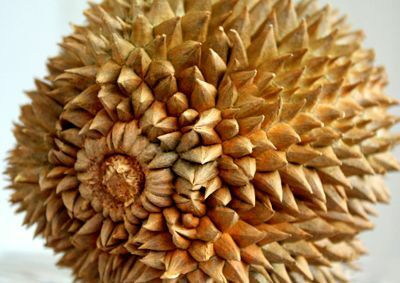 Looking somewhat like a sea urchin, durian is a unique tropical fruit mainly found in Asian countries. It has been called the "king of fruits" because of its enormous size (about 1 foot long), weight, and the large volume of edible flesh it contains. Usually, durian is either loved at first taste or immediately hated. Its fruit is sweet and buttery in texture, with very little juice—it may remind you of a Creamsicle. Durian can be eaten fresh or used to make various types of desserts. The most unusual thing about the durian is that it has a famously strong smell—so much so, it's banned from most public places in Southeast Asia, including hospitals and trains. When traveling, it's always humorous for Westerners to see a "no durian" sign posted beside the "no smoking" sign! 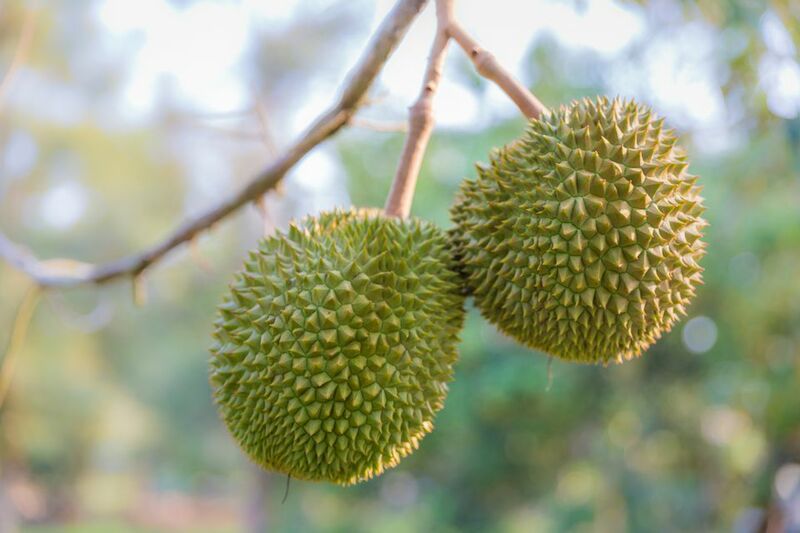 Thailand is the world's largest exporter of durian, and the fruit is sold in Asian markets or Asian grocery stores here in the U.S. Look for light-colored spikes without any dark brown patches or bits of white between the spikes, which are signs of overripeness. Durian fruit freezes well and is often exported and sold frozen. Store your durian in the refrigerator or a cool place until you're ready to open it. In order to cut the fruit, place the durian stem side down on a clean cutting surface. Using a large, sharp knife, make a cut through the thick skin in the top of the durian, about 3 to 4 inches long. As you cut, pull back the skin with your other hand, as shown. Now put your knife down and use your hands to open the durian. The skin will rip fairly easily. (Just be careful not to poke yourself against the spikes.) You should be able to open the durian completely now. Lay the two halves down on your cutting board. Using a spoon (or your hands), remove the large "pods" of fruit. Place the fruit on a plate. Before eating or serving, it's best to remove the stones. In some Southeast-Asian countries, these stones are boiled or roasted and eaten. Use your knife to cut along the seam down the center of the inside "shell" and you'll find more sections of fruit. Remove the additional sections of fruit with a spoon or your fingers and add to the plate. Working with durian can leave your hands smelling of durian all day long. Here's a tip: Running hot water through (or in and around) the durian skin creates a very mild lye water, which when combined with soap, helps gets rid of the smell. Since durian is a tropical fruit from Southeast Asia, it's no surprise that many recipes are from that part of the world. Give Laotian sticky rice with durian a try—a delicious dessert made with coconut milk. Or maybe you could whip up a homemade ice cream flavored with durian—a nice change from vanilla! The best thing about durian is that it's very healthy, with high concentrations of vitamins and minerals. It is unique among fruit in that it contains the B-complex vitamins and so is especially great for vegetarians and vegans. It's also rich in dietary fiber and high in vitamin C, potassium, the essential amino acid tryptophan, copper, iron, and magnesium.